In a shallow bowl or plate, combine flour, salt and black pepper. 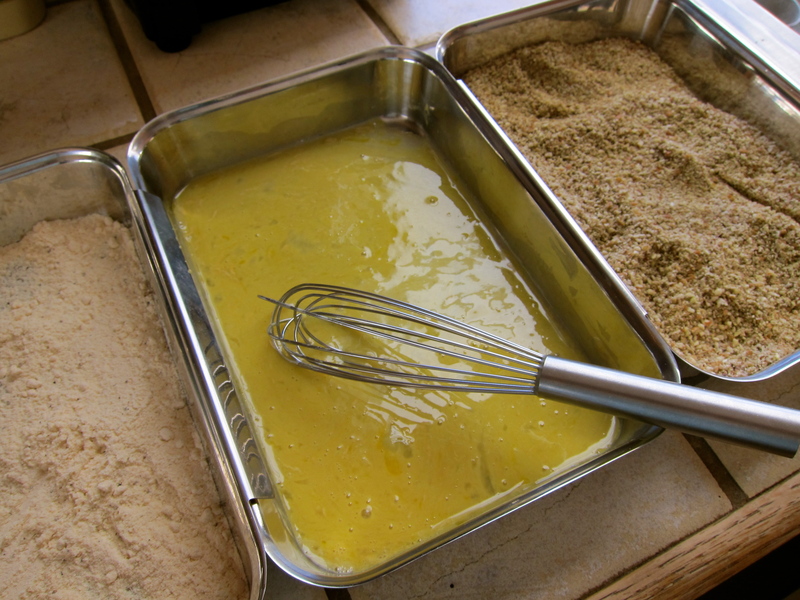 In a separate shallow bowl, whisk together egg, mustard and water. In a third shallow dish, combine pecan meal and sage. Set aside. On a flat work surface place a sheet of plastic wrap, center one piece of pork on the plastic wrap and cover with another sheet of plastic wrap. With the flat end of a meat mallet, pound the pork to 1/4 – 1/2 inch thickness, beginning in the center working outward. Repeat with remaining pork pieces. Discard plastic wrap. Dredge all sides of pork through the coconut flour mixture, shaking off any excess. Dredge all sides of the pork through the egg mixture, shaking off any excess. Dredge all sides of pork through pecan mixture, gently pressing the pecans onto pork. 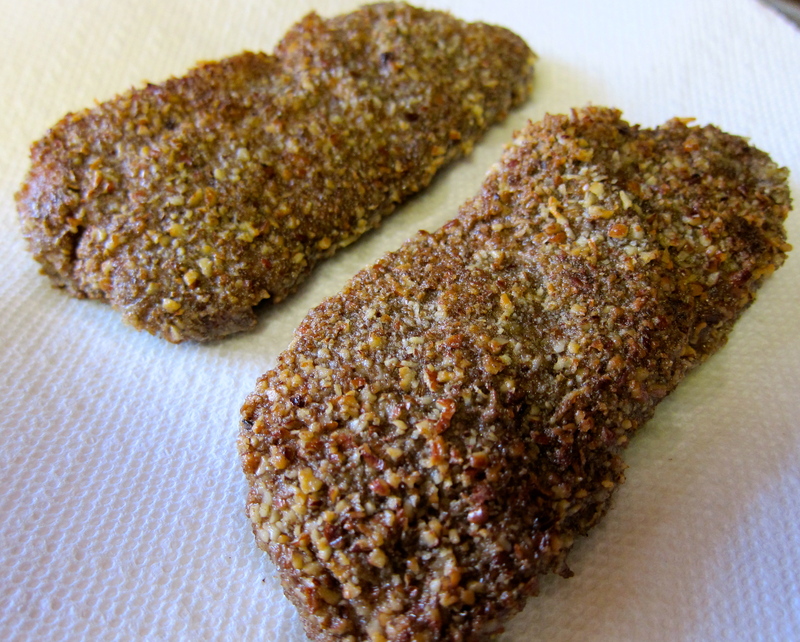 Transfer each dredged cutlet to a large plate or dish. In a large skillet, heat oil over medium-high heat. Add pork cutlets to the skillet and cook, turning only once, about 2-3 minutes per side. Remove to paper towel lined plate. Serve immediately or cover with foil and set aside while you prepare your side dishes. Don’t crowd the pan, use a large enough skillet to cook the cutlets in an even layer or cook in batches adding more oil as necessary. Make sure the pan and oil are hot before adding the pork otherwise the outer surface won’t crisp up but rather soak up the oil. When pounding the pork into cutlets, use gentle taps with a heavy mallet, heavy pounding may tear the meat. If you don’t have a meat mallet another heavy object will work such as a rolling-pin or heavy skillet. 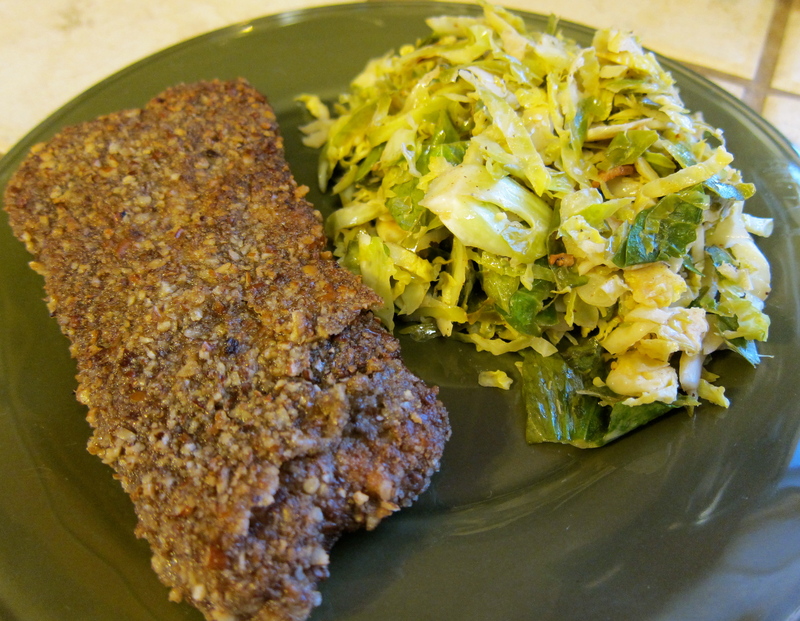 This recipe was adapted from the Panko & Sage-Crusted Pork Cutlets recipe featured in the March 2012 issue of Clean Eating Magazine. Pork cutlets pounded out to 1/4"
Dredging bowls from Williams Sonoma, love these! 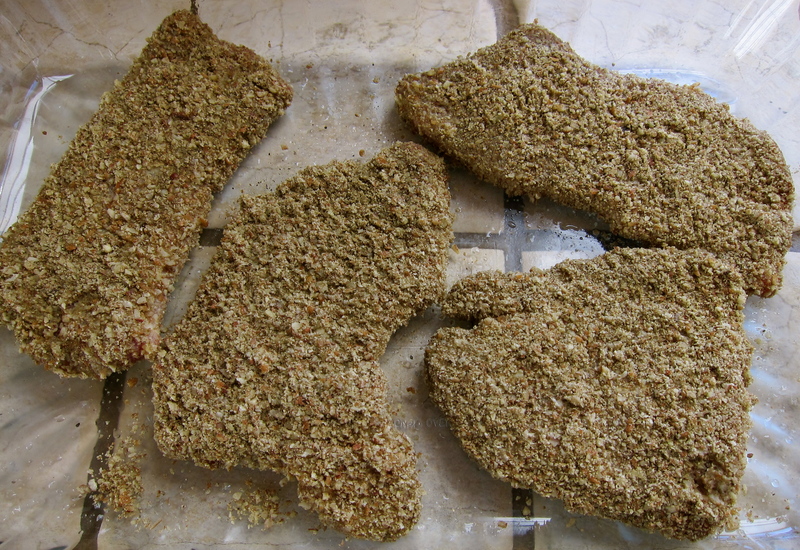 Dredged cutlets ready for frying. Who doesn't love a big pile of cookies? Preheat oven to 350 degrees F. Line two cookie sheets with parchment paper. In a large bowl combine almond flour, coconut, sea salt and baking soda. In a separate bowl whisk together coconut oil, coconut nectar and vanilla. Mix wet ingredients into dry ingredients until thoroughly combined, stir in chopped macadamia nuts and dark chocolate chips. 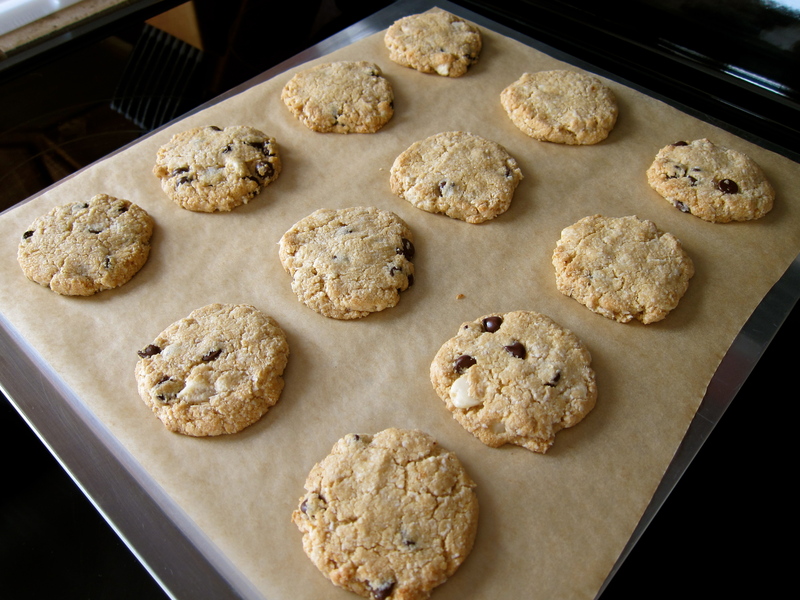 Drop by rounded tablespoons onto prepared cookie sheets about 2″ apart. The dough may seem slightly crumbly, just press it together and flatten it once on the cookie sheet, they will hold together once baked. 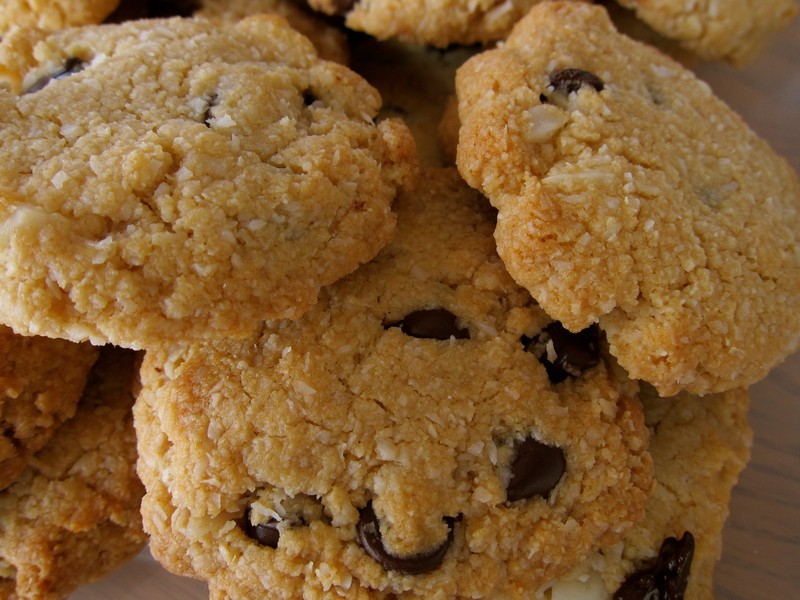 Bake for 10-12 minutes or until cookies are slightly brown on top. Remove from the oven and cool on a wire rack. Although these cookies are excellent warm they really are best after they are completely cooled and in my opinion even better on day two! Store in an air tight container. 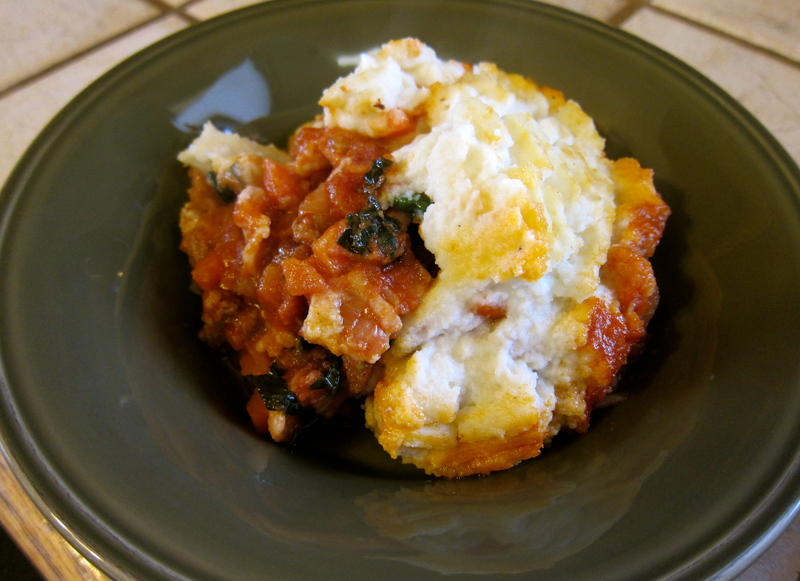 There have been a ton of Shepherd’s Pie and Cottage Pie recipes making an appearance in the Paleo blogosphere lately. They all look so tasty and like a wonderful, warm comforting food…today it was snowing in Colorado so I thought it would be the perfect day to try to make one. 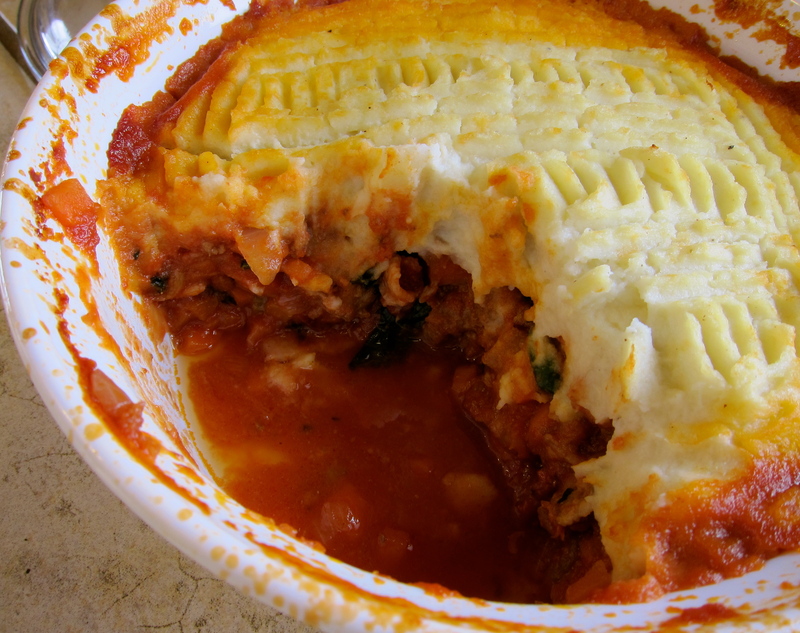 Elana’s Pantry posted this recipe for Paleo Shepherd’s Pie recently using cauliflower mash for the topping and a few months back Jan’s Sushi Bar posted this Sweet and Spicy Cottage Pie using mashed vanilla sweet potatoes on top. Melissa Joulwan’s Well Fed Cookbook has a fabulous recipe with many variations for Shepherd’s Pie using the traditional ground lamb as well as recipe on her blog for Cottage-Flower Pie. My version pulls things from all three recipes and I will have to say it was FABULOUS! 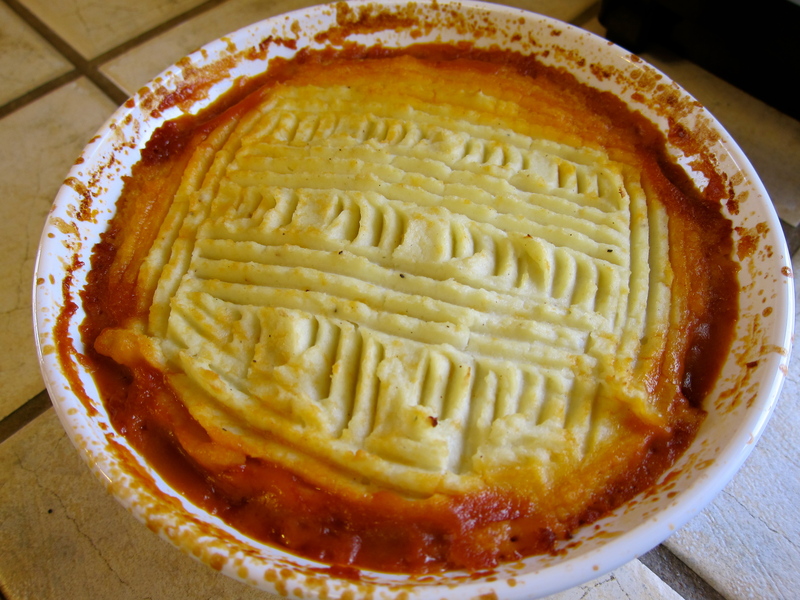 This was the first Cottage Pie I have ever made and it sure will not be my last! I was pleased with the photos of the Cottage Pie before it went in the oven and with the ones of it dished out in my bowl…the one of the final product after it was baked is not the best simply because I think I used too small of a casserole dish so the filling bubbled up over the sides of the cauliflower mash (and made a huge mess in the oven! )…now in my defense, I’ve never made this dish before so this could very well be a normal occurrence! I am calling this “Spicy” simply because it is just that, SPICY…I like it that way but if you prefer a milder flavor I would omit half of the black pepper and all of the red pepper flakes. 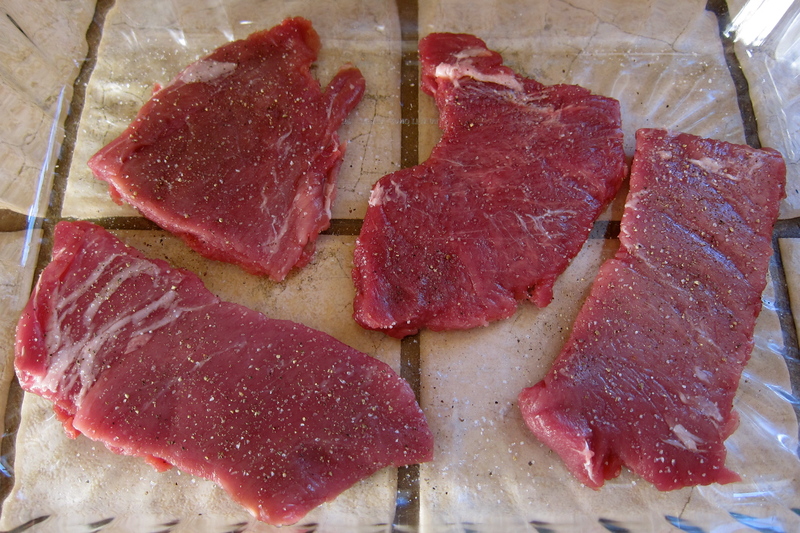 Preheat oven to 350 degrees F. In a large skillet heat butter or oil over medium-high heat, saute onion until soft. Add chopped bacon to the pan and saute until cooked, add carrots, celery and garlic and saute in the bacon fat until soft. Add the ground beef to the pan with the bacon and vegetables and saute until browned. Season the meat and vegetable mixture with the salt, pepper, red pepper flakes and paprika. 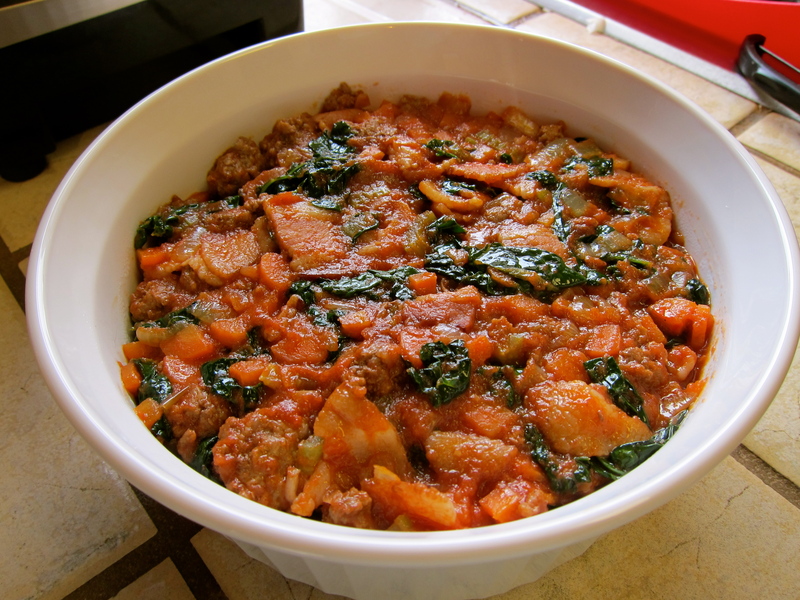 Stir in the tomato sauce, reduce the heat to medium-low and simmer for 15 – 20 minutes to allow the mixture to thicken. Add the chopped kale and cook until the greens are wilted. Transfer the meat and vegetable mixture to a casserole dish (the one I used was a 1.7L Pyrex…I’d go a bit bigger!). 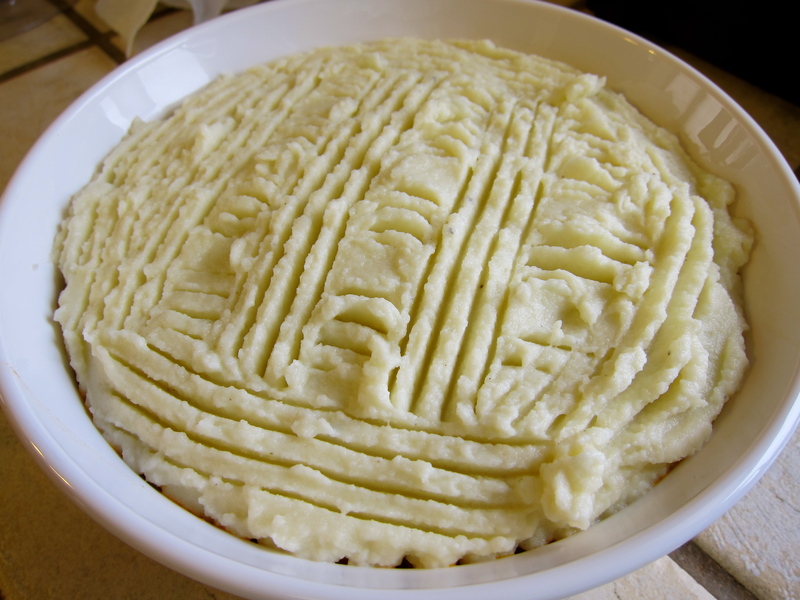 Carefully spread the cauliflower mash (recipe follows) evenly over the top of the meat mixture. Using the tines of a fork, lightly create some texture on top – the peaks and valleys make nice brown spots in the oven. Bake for 20 – 30 minutes until the top begins to brown (I would have browned mine more but it was splattering all over the oven!). Remove from oven and allow to rest for 5 – 10 minutes before serving. Place ingredients in a food processor and puree until smooth. Looks aren't everything...it tasted GREAT!